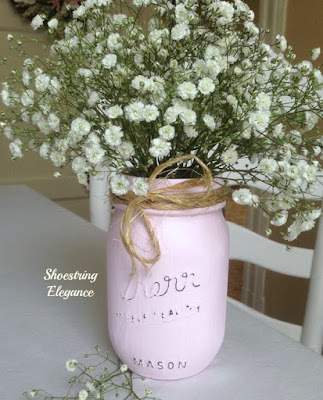 Shoestring Elegance: Chalk Painted Mason Jars! I have been a very busy blogger here, this Spring! I LOVE it! The weather has been nice enough for beautiful blooms galore everywhere you look, yet cool enough that it's not uncomfortable and still a good time to have projects to do inside. It really would be the best of both worlds, if we weren't in the worst drought in history, here, in Northern California. I am often asked, for one occasion or another to make floral arrangements. Whether it be for a church function, holiday festivities or family event. I imagine you have seen some of my arrangements, here, by now. If not, where have you been? And, Welcome! I am very excited that my Nephew is getting married in July! His quite, smart and savvy fiance, is a Pinner, a Cook, and a DIY'er, too, and quite gifted! So, when I heard she wanted a budget-friendly, country shabby-chic-ish reception, I, of course, asked what I could do. Her colors are Coral and Navy, which I had really not seen much of, I admit until I searched it on Pinterest, boy was I out of the loop!! It is, apparently, an extremely popular combination these days! Having tinted chalk paint before for events, I asked if she would like me to do some Mason Jars in her colors to which she graciously accepted my offer. She was, also incorporating burlap into her theme, so twine tied around the neck of the jar was a natural fit for her coral, chalk-painted and distressed jars! Here they are! What do you think? Sorry for the blur, but I was matching the coral to their Wedding invitations, that had not been sent out yet. I think she is very happy with them! How nice for me to have some small part in their special day! I am tickled pink! Pink.....pink, was the very next thing on my mind! 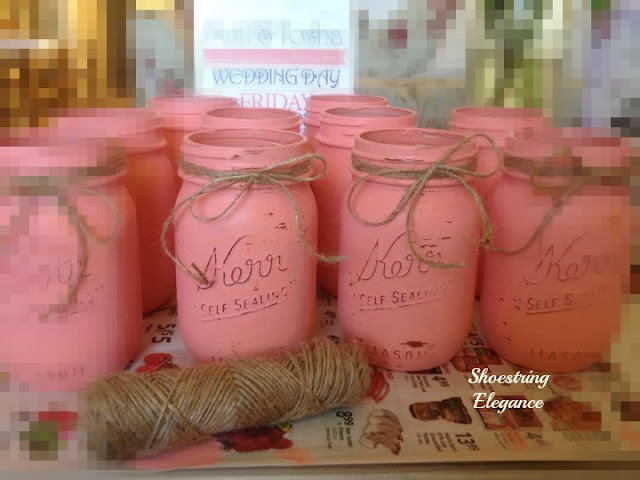 I had a few jars left over, of course, so I tinted some of my Behr Chalk Paint with Michael's Craftsmart pink paint. (just a couple drops was enough) Do you have a preference? Plain Chalk painted...with distressing... with twine...organza bow or maybe just Baby's Breath? Lucky me! 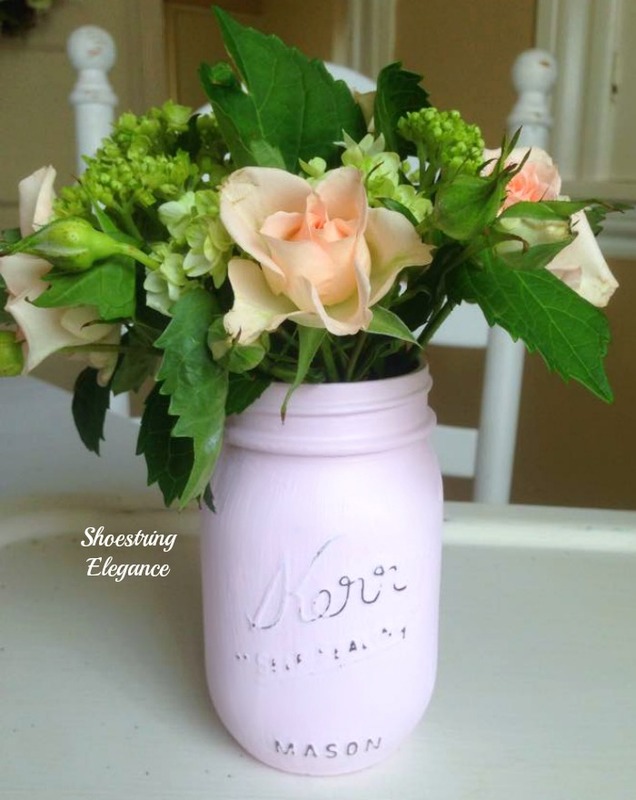 I was left with 3 beautiful arrangements and jars. I am making 10 more arrangements this Saturday night for a celebration, at my church, for our newly baptized. I ABSOLUTELY love decorating for this event! It's always such an incredibly wonderful day to celebrate when people choose to walk with Christ in their life! Beautiful people I share with! I think they are all gorgeous - appropriate for different designs. 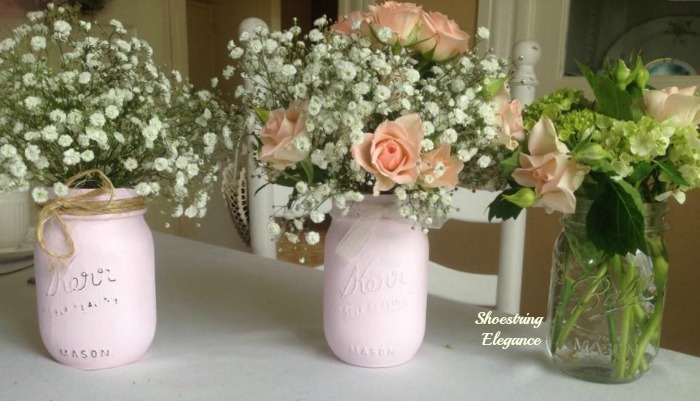 If the party is a rustic one (such as the wedding), the distressed one is GORGEOUS! 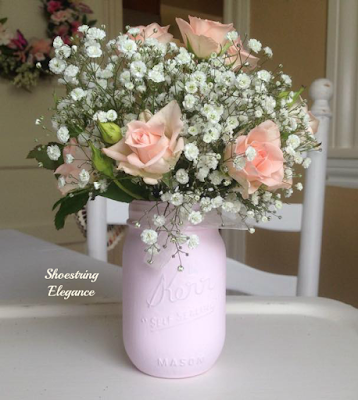 The second one leans to a more formal (yet rustic, with the jar) vibe, and the last - those hydrangeas mixed with the roses, pop! Love them all. You're definitely talented at floral design! I agree with Heather's comment. They are all lovely and each would be great for different decor themes. I love the distressed one best with greens and roses. The roses are the perfect touch to me. So pretty! Me, three! All are perfect for different occasions/themes! I really like the distressed one with the burlap because simple and rustic are my favorite combination. As usual, they are ALL stars in my book! Thank you so much, Sally! You are always so kind to me and my little projects! Thanks, too for weighing in, here! I truly do love them all, too, but I need to pick one to go with! Hugs. Have a wonderful weekend! I love those painted jars - they look soft and simple with the flowers you picked for display. Nice Job! Okay, the light distressing is so pretty. In the one with the three in one picture I love the middle one for a wedding. I think you need the roses so it perks things up more than just the baby's breath. I don't think the bow is needed if you have enough flowers/greens/etc. though. Am I ANY help? Those are gorgeous! So simple and elegant. Your painted canning jars are beautiful holding those incredibly lovely flowers! Thanks for sharing this easy DYI idea. Thank you so much, Michelle! Wonderful weekend wishes to you as well! They're all beautiful. My favourite are the first two. Love the roses.